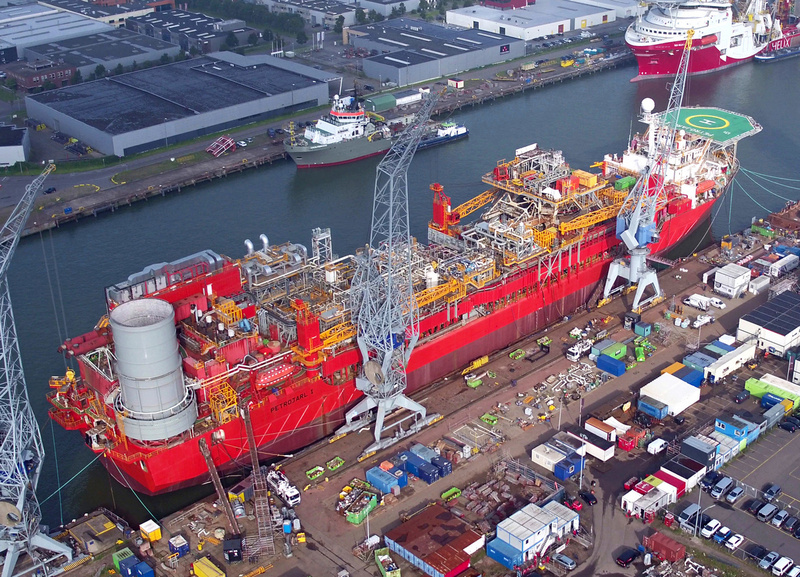 Damen Shiprepair Rotterdam (DSR) has delivered the FPSO Petrojarl 1 to Teekay Offshore following a complete redeployment project taking place over the past 2 ½ years. The Petrojarl 1 has been operated by Teekay for 28 years in the North Sea and is now destined for the Atlanta Field in Brazil. After extensive engineering (over 450,000 engineering hours), more than 50% of the process equipment was removed and replaced by new and additional equipment, required to treat heavy oil at the new location in accordance with the most stringent specifications and Brazilian compliance requirements. The available deck space presented major challenges during engineering and execution of the work on board, which was done by Damen and its subcontractors. All workers returned home safely every day. “The Petrojarl 1 project fits within the strategy of Damen to expand further into the repair and conversion of complex offshore vessels and operating units. The recent acquisition of the Damen Verolme Rotterdam yard (DVR), located in the Botlek area of the Port of Rotterdam and holding an extensive track record of successfully refurbished offshore vessels, further complements us in this ambition.” says Mark Witjens, Director with Damen Shiprepair & Conversion responsible for the project. Damen believes that, with DSR and DVR, it offers clients two yards in the Rotterdam area with excellent facilities and management capabilities to perform any conversion or refit, however complicated, at the highest standards of safety and quality. The self-propelled FPSO spent 14 months in Dock no. 8 (300x50m) undergoing refurbishment of its marine systems, underwater hull, seawater system, crane booms, heating coils in the cargo tanks and specialised steelworks in the upper and lower turret areas, which needed to be completely revised and adapted to suit the 1500 metre deep mooring location. Simultaneously, new designed high quality, prefabricated equipment skids containing heating, cooling, separation, compression, boilers, centrifuges as well as a new E-house with electrical equipment were placed on board. Interconnecting piping and cabling was subsequently installed to complete the topsides and connect it to the remaining facilities. The successful completion of the Petrojarl 1 project confirms Damen’s capability to perform the most complicated refurbishments of offshore production units, involving design, procurement and installation of all systems and equipment required for safe and reliable operations at sea.